I know I should have written this event up ages ago, but time seems to be slipping away from me. 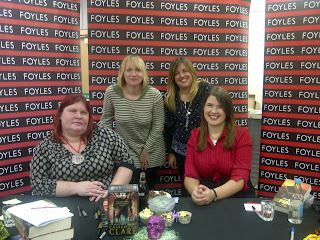 In October, I went to Foyles with my friend Yvette, to Cassandra Clare's book signing. For those of you who have been living under a rock, Cassandra Clare is the author of The Mortal Instruments series as well as the steampunk series, The Infernal Devices. 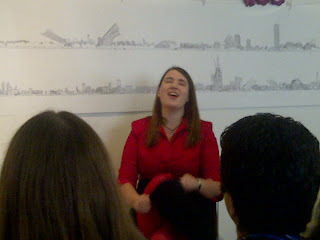 Cassandra was in London to publicise the publication of Clockwork Prince which was published in December. The queue to get into the event was huge by the time we arrived and we were there an hour early. The UK has some serious Cassandra Clare fans. Lynsey from Narratively Speaking managed to get in the front row. This is my long suffering best friend Yvette, who I often drag to book events with me. Luckily she loves Cassandra Clare's books as much as I do. 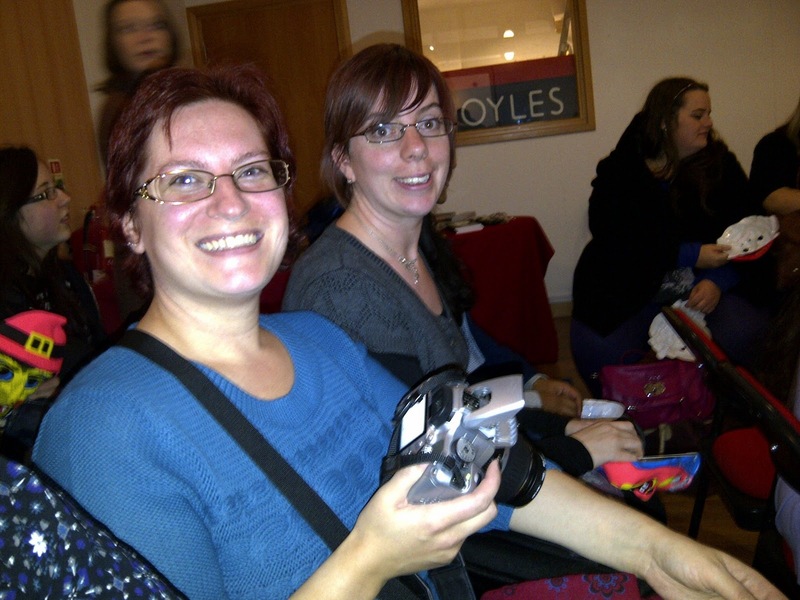 Sarah from Feeling Fictional and Kirsty from The Overflowing Library were also with us. We were surprised and extremely excited to find out that Sarah Rees Brennan would be interviewing Cassie. Sarah is the author of The Demon Lexicon series. She was really really funny. Sarah picked out questions from the audience and Cassie was kind enough to answer them. We then queued up to get our books signed. The queue was huge, so I do feel for Cassandra signing for such a long time. I took notes whilst listening to the interview, so I thought I would share some of the questions and answers with you. The questions relate to both series, so I shall add in brackets the series referred to. Q: Will Seb ( The Mortal Instruments) feel any remorse for what he has done? A: Sarah Rees Brennan thought that Seb had received a lot of unnecessary flack and blames his issues on a bad upbringing. Apparently Sarah, likes to go on Cassandra's computer and change the story so Seb comes across as nice as she adores him. Cassandra didn't think he would feel any remorse but he might try and find someone like himself. Q: What scene are you most looking forward to in the film ( City of Bones)? A: The entrance of Magnus at the party. A: White Cat series by Holly Black. Daughter of Smoke and Bone. The Chaos Walking series by Patrick Ness and Demon's Lexicon. Q: Are you planning to write any more series? A: Cassandra is considering writing a Dark Artifacts series which will not have any shadow hunters in and will be more dark fantasy. Q: How do you plan what is going to happen to the characters? 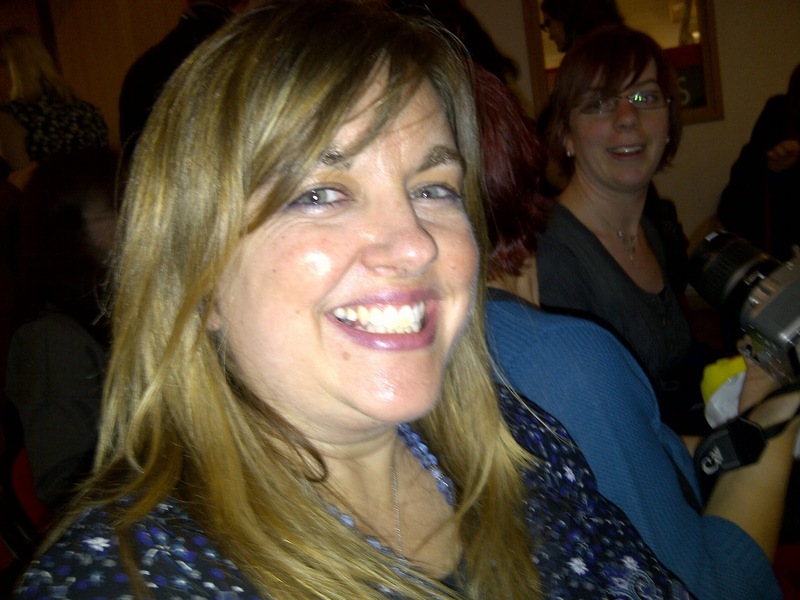 A: A lot of micro plotting meetings with her trusted friends including Holly Black and Sarah Rees Brennan. They go through the book, chapter by chapter, scene by scene. Also acting out scenes. For instance, she tied Holly Black and put her in the back of the car for research purposes. Also got caught trespassing a small pox building in New York whilst researching. At one point, she had Holly and Sarah playing out the roles of Jace and Clary during a love scene. Their husbands were desperate to watch and provide comments! Q: Would you ever write a book for the adult market? A: Yes, although all ideas have been for the Young Adult market so far. Q:Who is the inspiration for your characters? A: They are a mash up of all the people she knows. The character Simon, is made up of her husband and his best friend, yet also has the interests of Holly Black, who is obsessed with Dungeons and Dragons. Q: Why did you make Jace more vulnerable(The Mortal Instruments) ? A: Cassandra did not view him as being more vulnerable. He was just opening up more due to his relationship with Clary. Q: Which actor would you like to play Simon? A: Cassandra stated that she doesn't like to pick as it often comes back to hit you in the face, if another actor gets chosen. Q: Which character would you like to meet and what would you do together? A: Something safe, like shopping with Magnus. Q: How do you choose titles? A: City of Bones was inspired by the city made of bones in Prague. She recalls the bone chandelier there. Clockwork Angel and Clockwork Prince came from the a short story that Cassandra described as rather crappy. Q: Where did you get your inspiration for Clockwork Angel? A: Cassandra was interested in the Victorian era and whilst standing on Blackfriars Bridge, she had an image of a Victorian boy and girl standing in the fog there. 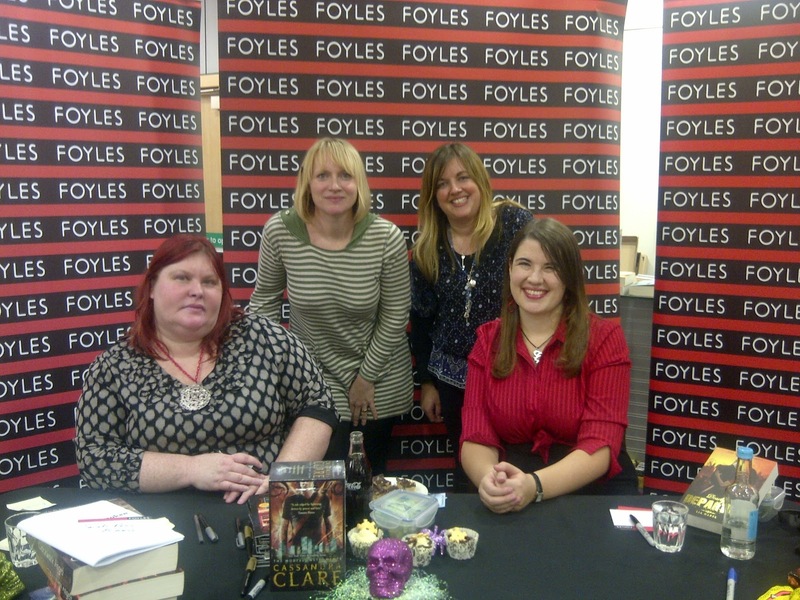 I really enjoyed meeting Cassandra Clare and I look forward to the chance to meet her again. This sounds like such a great event. I'm sorry to say that I haven't read anything from either of the two authors but I have The Mortal Instruments series here and The Demon Lexicon. Cecily - OMG! Really? Are you sat behind Sarah? Oh we would have said hello if we had known. SisterSpooky - I didn't get any pictures of you with Leanne and Andrew! I am sorry. It was fabulous though. 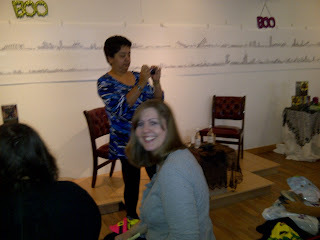 I went to a Cassandra Clare event last weekend and took notes too. The sound system wasn't very good, though, so I had trouble understanding everything. I have to tell you that I LOVED the enthusiasm of all of the young people who were there for the event!! Bermudaonion - I am so pleased you got to meet her too! 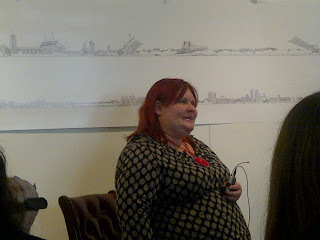 Younger or older we can love Cassandra Clare!Trust me, I am in there with the teenagers and they let me! This looks like a super event! Thanks for sharing your photos, Vivienne! I may have to check out Cassandra Clares books. This sounds like a fun event!